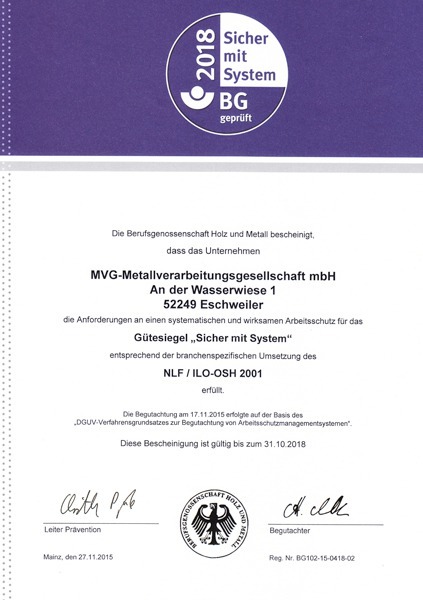 In 1993 MVG was the first towbar and electrical kit manufacturer in Germany to receive the quality certificate in line with ISO 9001. This ISO 9001 credential is renowned as a worldwide standard for effective quality management. As a manufacturer of towbars and electrical kits, we at MVG stand for quality products designed and made in Germany. 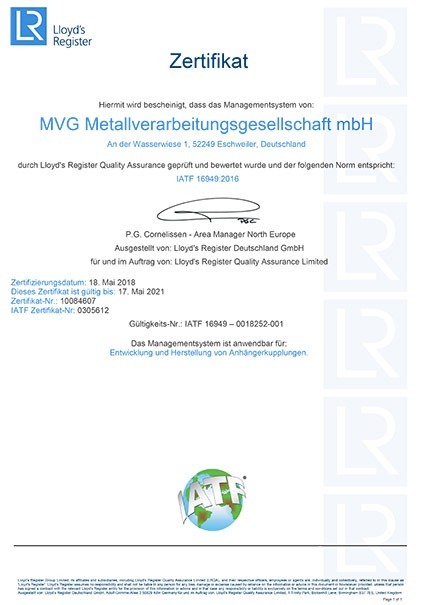 In 2001 we were awarded the ISO/TS 16949 certificate; this certification is relevant for the entire supply chain of the automotive industry, and therefore also for our manufacture of towbars and electrical kits at MVG and for our suppliers. As one of the first manufacturers we were awarded the new IATF 16949 in May 2018, which replaced the ISO/TS 16949. 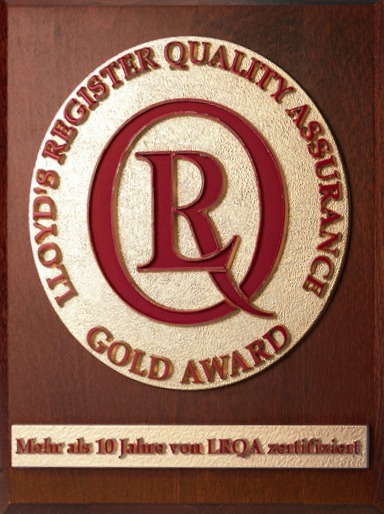 In August 2008 MVG received the Lloyd’s Gold Award for successful quality management. 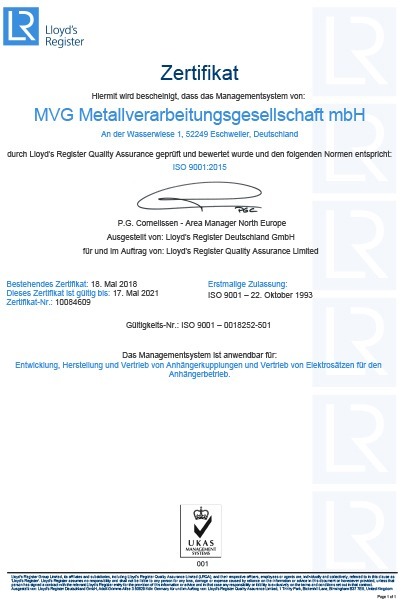 In more than 10 years the MVG Quality Management System has contributed significantly to improving internal workflows, reducing costs and reinforcing the company’s competitive standing. In October 2012 MVG was awarded the seal of approval “Safety with System” by the Trade Association Wood and Metal – this is an award for successful management in the field of occupational safety. This seal of approval complies with the worldwide recognised standard ILO-OSF 2001 for occupational health and safety systems specified by the “International Labour Organization”, the health and safety organisation of the UN. In the audit summary particular emphasis was placed on the active involvement of the employees, effective risk assessment and risk prevention, as well as the integration of health and safety programmes in the existing MVG management system. For improvements in environment and energy management MVG was certified as an ECOPROFIT organisation in 2009 and 2012 in line with ISO 14001. 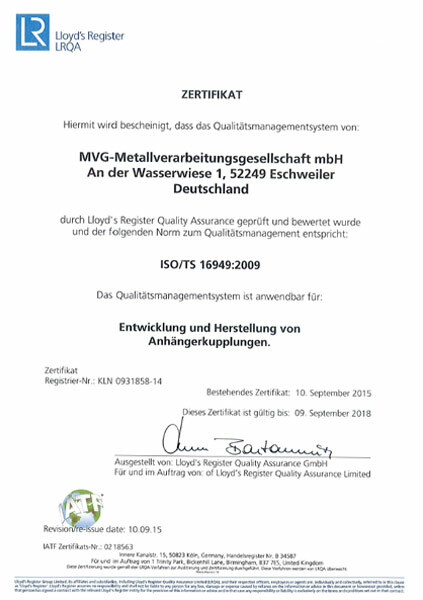 The current distinction in occupational health and safety is for MVG, as a manufacturer of towbars and electrical kits, a further testament of sustainable management in keeping with the times, which has a professional attitude to considering not only an environment-friendly and energy-efficient production, but also safe working conditions. As a manufacturer of towbars and electrical kits, we at MVG stand for quality products designed and made in Germany. 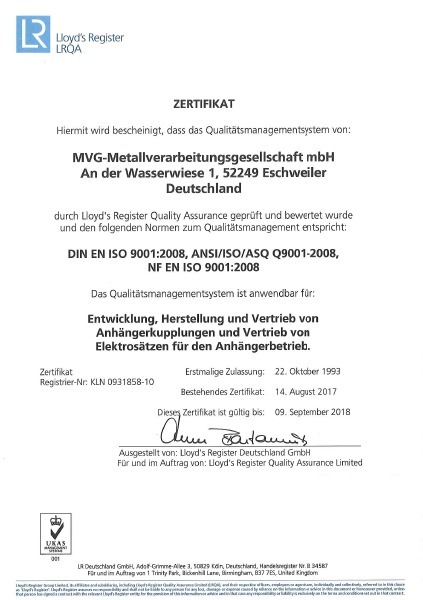 In 2001 we were awarded the ISO/TS 16949 certificate; this certification is given on the basis of the specifications provided by the International Automotive Task Force and is relevant for the entire supply chain of the automotive industry, and therefore also for our manufacture of towbars and electrical kits at MVG and for our suppliers.